Looks like Blake lizotte is signing with the king's. I would think this would mean achan and hrenek have limited reason to stick around if they get fair offers. I'm kind of ok with it as I said following NCAA disaster #3 I want to move past all of Bob's recruits and see what Larson can do. I still remain hopeful for next year but a complete collapse for the first time in over a decade seems possible. I hope it's not true but this is the one thing that kid on twitter seems to have any knowledge of. Seems early for Blake unless he has a hatred of school/the coaches. If they all want to go pro then great do it now so I can just turn off college hockey mentally for 6 months without having the wounds re-opened every so often. The job will get a lot harder for Larson now but his focus from a recruiting standpoint has been much more building from the goal out and I have no problem with that. I did not foresee Lizotte going this year, I think he would have been much better off with one more year under his belt. That one is going to sting. Any word on Ahcan yet? Given the sheer number of 'D' we have, and in particular the late addition of Trejbal, I wonder if they aren't expecting him to depart. At present I still feel good about this team, but to me the base expectation becomes home ice for the 1st round. Certainly there won't be as much margin for error with the hit to the offense (esp. less Blake), but I feel good about the 'D' both now and in the pipeline. Hopefully they thrive with being more the hunter than the hunted. Still, all the best to him! If Easton Brodzinski gets better as a two-way player, I believe it will help his scoring and be a big help to this team. Micah Miller IMO will improve and be a integral part of the Huskies next season. Nick Perbix should improve in leaps and bounds. Same thing for Hentges. Fitzgerald was having a great year and then got clobbered by Wolfe. I think he and the Poehling brothers will be an outstanding line and will be expected to score more. Nolan Walker will be better--and he had an outstanding freshman season. Bushy will be a force on the blue line, much like Jon Lizotte was for the past few years. Jack Ahcan will possibly be one of the best D-I defensemen in the country. Sleepers? I believe Luke Jaycox and Jake Wahlin will both improve and take on a leadership role. Questions? Back up goaltenders. How will the incoming recruits perform? Kudos to HuskyFan64 for his energy and being a GREAT SCSU Hockey Fan! And thanks to Hockeypuck for his endless work on giving us Husky fans oodles of information, stats, etc. It is greatly appreciated. And a big thank you to Brett Larson and his coaching staff. They did an excellent job and did it with class. What a year!!! Boomer wrote: If Easton Brodzinski gets better as a two-way player, I believe it will help his scoring and be a big help to this team. Micah Miller IMO will improve and be a integral part of the Huskies next season. Nick Perbix should improve in leaps and bounds. Same thing for Hentges. Fitzgerald was having a great year and then got clobbered by Wolfe. I think he and the Poehling brothers will be an outstanding line and will be expected to score more. Nolan Walker will be better--and he had an outstanding freshman season. Bushy will be a force on the blue line, much like Jon Lizotte was for the past few years. Jack Ahcan will possibly be one of the best D-I defensemen in the country. I just don't see Jaycox ever being a major contributor. He had big turnovers in every game I went to this year and most led to goals. Larson couldn't wait to get him off the ice. Hey @SCSUHUSKIES_MH Fans! 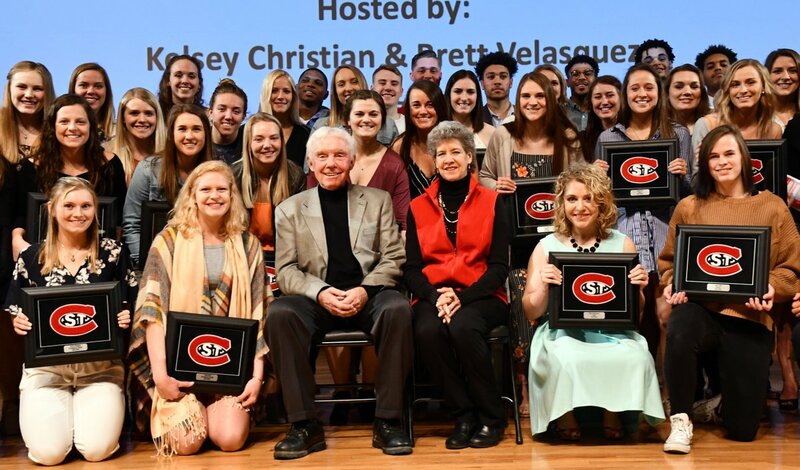 You are all invited to the Huskies Hockey Fan Finale Social in the Brooks Center Atrium on Thurs., April 18th starting at 5 p.m. for a meet & greet with the team & ice cream sundaes. 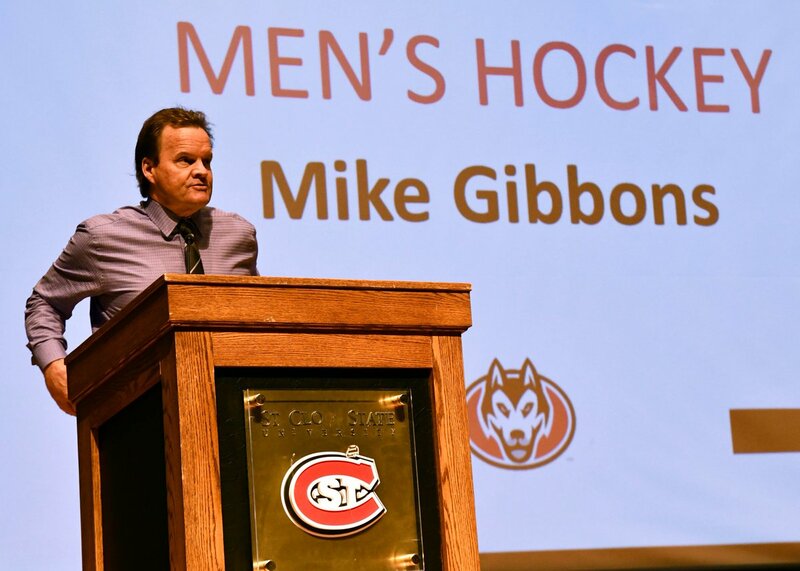 Comments from head coach @BrettLarson18 and @SCSUHUSKIES_AD as well. 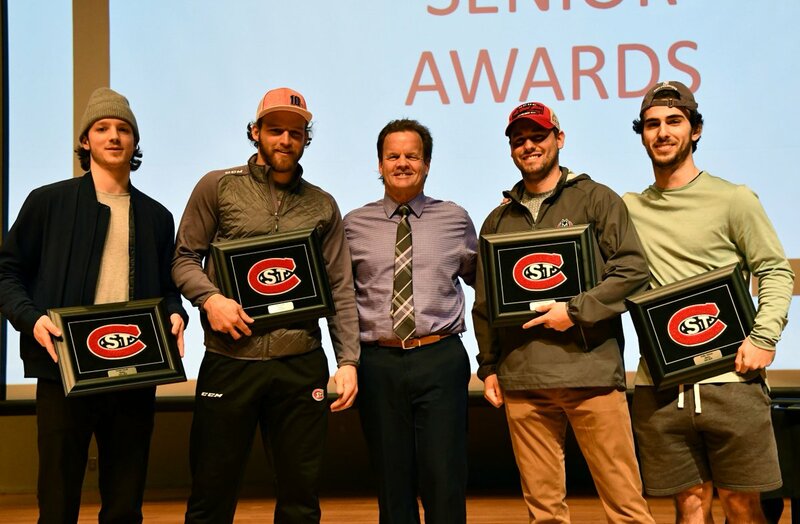 ICYMI: You're invited to the @SCSUHUSKIES_MH Fan Finale Social in the Brooks Center Atrium on Thursday starting at 5 p.m. for a meet and greet with the team and comments from Head Coach @BrettLarson18 and @SCSUHUSKIES_AD. Ice Cream Sundaes with toppings will be served as well! I was there too. Great time, thanks to the players for a great season! Can't wait for next year. Talked to Gibby and Larson about a strong class coming in, strong D core and goaltending. A lot of the players mentioned people will be surprised how good they'll be next year. Should be very exciting. Schedule is also out. Last edited by hockeypuck on 18 Apr 2019, 20:24, edited 6 times in total. With Hrenek and Achan coming back it looks like we should at least contend for a top 4 finish in the NCHC. We lost a lot out of the senior class and of course the losses of Poehling and Lizotte are big but it could have been a lot worse. It will be interesting to see what Nick and Jack Poehling are able to do, they along with Ryan always seemed to score huge goals even if they didn't score a ton of goals overall. Defense has Ahcan, Perbix, Bushy, Meier, Anderson, Jaycox and Kuster coming back. Add Zinns ( 46 pts in 58 GP for a D), Trejbal (40 pts in 55 GP) and Zeimer (18 pts in 55 GP) coming in. Both coaches mentioned Trejbal and Zinns are very good. Solid D core. Offense has J. Poehling, N. Poehling, Fitzgerald, Walker, Hentges, Brodzinski, Miller, Wahlin, and Hammer coming back. Still pretty solid. Then add 3 top Fwd's in Krannila (45 pts in 60 GP), Kupka (71 pts in 60 GP) and Okabe (58 pts in 60 GP) plus a solid Molenaar (33 pts in 53 GP) and possibly Enebak (24 pts in 51 GP). Looks very good to me. One coach was high on Krannila last year and also mentioned the two AJHL's being very good. They also have all summer to look for possibly one more. Goaltending, Hrenak coming back and Lamoreaux backing him up. Zevnik could also possibly be back. Solid again... Mentioned Lamoreaux playing for a team giving up 50 shots so he should be a lot better with a D only giving up 20.